» A Movie Review by David L. Vineyard: BIG BROWN EYES (1936). 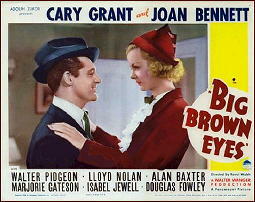 A Movie Review by David L. Vineyard: BIG BROWN EYES (1936). 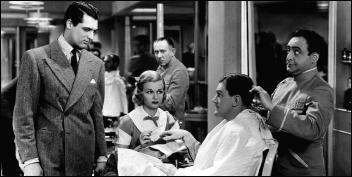 This relatively short comedy mystery is as close to a B-programmer as Cary Grant ever made, and despite being a disposable example of the fast-paced fast-talking comedy mystery of the era, is well worth seeing. 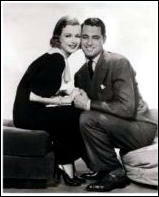 Mildly screwball and played much in the vein of the “Thin Man” films, this is a minor film, and until recently hard to find, but there are several points of interest. Grant is Danny Barr a detective sergeant whose girl friend Eve (Bennett) is a manicurist with a nose for news. As the movie opens Danny is in pursuit of gangster Russ Cortig (Nolan) who heads a gang of jewel thieves and who fired a stray shot in a police chase that killed an infant. 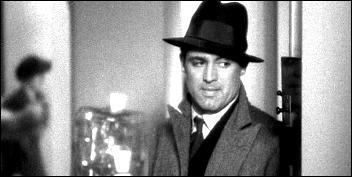 A bit grim for one of these ‘light’ romantic crime comedies, but fortunately played for as little pathos as possible. Eve gets her dream job on a newspaper, Cortig gets off thanks to a slick lawyer, and Danny quits the force and turns private eye to get Cortig on his own. Meanwhile the wise cracks spark like fireworks and the pace and patter never falter long enough to ask any serious questions. Eve leaves her dream job when her paper turns on Danny and goes back to her manicurist job, and it’s there she stumbles on the clue that turns the whole thing upside down. We cut to the chase and Grant closes in on Cortig and his gang for the big finale and the final clench. This sort of thing lives or dies on the capability of the cast, and Grant and Bennett are more than capable of the kind of sparks needed to keep this going. This is a slight film, and Bert Hanlon’s script could be better, but the cast and director push through, and the result is worth 77 minutes of your time. It’s far from Walsh’s best work, but it’s interesting to see Grant more or less playing a private eye, especially considering Raymond Chandler once suggested he would have been the ideal screen Philip Marlowe. If nothing else it’s interesting to see an early version of Cary in the kind of role he played in films like Notorious and Charade. Bennett, Pidgeon, and Nolan are all old pros and a cast of familiar faces rounds out the rest. I suppose you could complain that with that cast it should be better, but instead just enjoy it for what it is, a painless little preview of better things everyone involved would do. Nolan in particular is an interesting case, as his career had an unusual arc, playing a mix of villains. heroes, sidekicks, and good cops, fathers, and doctors well into the television age, with hardly a break in his screen appearances. If you watch this or any Nolan performance a second time, you might take note of the fact he was profoundly deaf, and as a result pays particular attention to his fellow actors looking for the visual clues to when his character is to act or speak. His Michael Shayne series offers an early look at the classic private eye persona on the screen well before the noir era. Pidgeon’s notable career was just starting, having come from a major hit on Broadway in the production of Ayn Rand’s tricky Night of January 16th. At this point the studios didn’t quite know what to make of him and he was often cast as slick lawyers, reporters, or even gangsters (the role he played in the Rand play). His stalwart leading man stereotype was still a few years ahead of him. 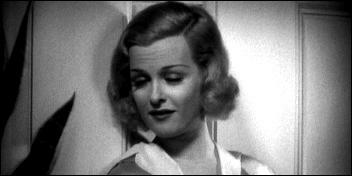 Bennett had been around since 1929’s Bulldog Drummond with Ronald Colman and would be one of the actresses considered to play Scarlet O’Hara in Gone With The Wind, but her best work would come in film noir, notably in Fritz Lang’s Woman in the Window and Scarlet Street opposite Edward G. Robinson, as one of the screens most ruthless femme fatales. Later, of course, she ended her career with a continuing role on the cult soap opera Dark Shadows. Note: The big brown eyes of the title are Grant’s, but it’s still an odd title for a mystery, even a comedy mystery. What’s amazing to me is not that I’ve never seen this movie, but I’d never even heard of it until David sent me his review. But I see that it’s available in a DVD set of equally less well-known Cary Grant films from the 1930s, and it’s now in my Amazon shopping cart, even as I speak.